On behalf of the Australian Catholic Bishops Conference, Archbishop Hart said, ‘As Bishops we invite you, the youth of Australia, to open your hearts to Christ. You are deeply loved by Jesus and the Church. We appreciate your gifts and contributions, and we want to journey with you. Young people have a great capacity to address injustice and create new opportunities for joy and hope. Today, many young people want to serve, and others are willing to take a chance to make the world a better place. Leaders and older members of the Church must continue to listen to and benefit from the many graces of youth, supporting them to discern their vocation and identify their call in the world, within communities where they are safe, nurtured and respected,’ Archbishop Hart added. 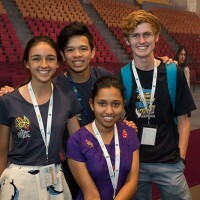 The Year of Youth will be part of a journey of dialogue and discernment as the Church in Australia contributes to the next Synod of Bishops in Rome during 2018 with its focus on ‘Young People, Faith and Vocational Discernment’ and as preparations commence to host a Plenary Council in Australia during 2020.